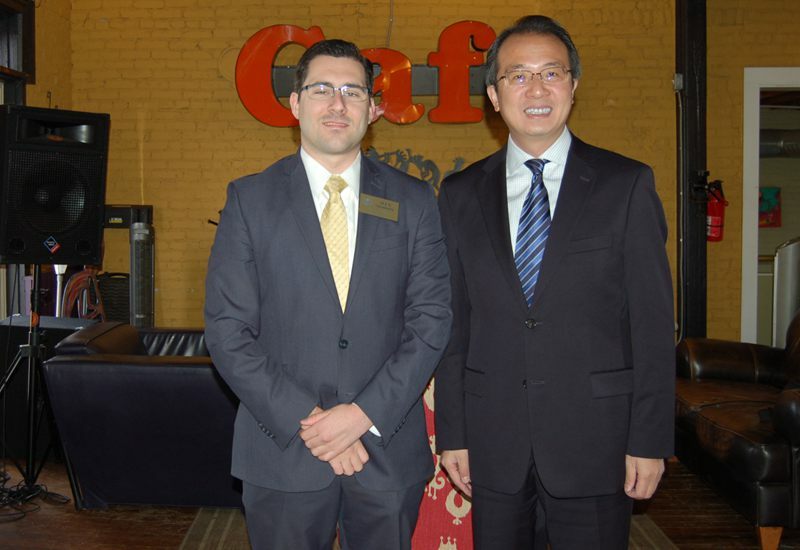 On November 21, Consul General Hong Lei met with Alex Morris, Field Representative of Congressman Tim Walberg of Michigan's Seventh Congressional District, in Jackson, Michigan. Consul General Hong Lei said that Governor Snyder of Michigan had just concluded his visit to China. The visit was a great success and achieved fruitful results. Close exchanges and cooperation in trade, investment, education, culture and other areas between Michigan and China has become a major highlight of Sino-US sub-national cooperation. As the world's largest developing country and the largest developed country as well as the world's two largest economies, China and the United States are shouldering important responsibilities for jointly safeguarding world peace and promoting global growth and have great common interests in a wide range of fields. The two sides should uphold the principle of mutual respect, mutual benefit and win-win cooperation, ensure a smooth transition of Sino-US relations to the next US administration, and carry out more cooperation for the benefit of the two peoples and the international community. The Consulate General is willing to work with Congressman Walberg and the District Office to promote the friendly cooperation between China and Michigan and the continuous progress of Sino-US relations. Maurice said that the Congressman Walberg highly values Sino-US relations and believes that the United States and China as the world's top two economies, can cooperate in many areas, and the two sides should strengthen exchanges in trade, education and other areas. The District Office is willing to maintain close contact with the Consulate General to deepen cooperation between Michigan and China in various fields.